When you pick up your needles and start knitting for the first time, you'll join an extended family that covers the globe and goes back in time. Knitting connects you. As soon as you venture out into the community with wool and needles in hand, all manner of people talk to you, even if they've never met you before. All those long strands of yarn link us all together with questions about technique, gauge and ply, and it's quite common to show unfinished work to complete strangers and to listen to tales about old knitting needles, learning to knit as a child and being warmed to the bone by home made woolly jumpers and socks. Knitting arouses memory, curiosity and friendship. At the moment, I'm working on a jumper for Hanno. It's quite a simple design, in washable pure wool and if I keep going at my current pace, it will be finished by the end of June, maybe a little bit before. There is nothing better than settling into a comfortable armchair on a cool Sunday afternoon and watching an English murder mystery while chatting and knitting. My sister is visiting at the moment, she was sitting on the sofa with her quilt which she is hand stitching, and as I sat in my arm chair and picked up my knitting needles, a cool breeze came through the back door and I knew that this was where I was meant to be. Are you still hovering on the edge of knitting? Knitting will help slow you down, it's like meditation when you knit alone and an invitation to connect when you knit in public. You can knit gifts of mittens, scarves, hats, dishcloths and bags when you start, and the more advanced jumpers, shawls, socks, and soft organic baby wear when you develop your knitting technique. Whatever you knit will be unique and not a replica of the thousands of commercially produced knits that flood the market from China. We are starting a knitting group at our neighbourhood centre soon. I have no doubt it will be popular with those people wanting to learn how to knit as well as those who like to knit with others around. Knitting circles are an excellent way to develop friendships and community - there are many groups I know of that knit for charity. I've been on the receiving end of that kind of generosity in my voluntary work and it fills be with a warm fuzzy feeling to give scarves, mittens and beanies to our homeless people that have been sent to me by the knitters here. Knitting connects us all. I have come to the realisation that if you're a knitter, you'll usually have something on your needles in every season. I am tending towards wool knitting in the cooler months and cotton knitting when it's warmer. I would love to know what you're knitting right now. 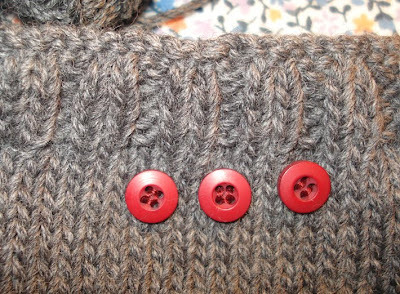 And if you have any patterns to share here - something that you love or a quick and easy knit, please let me know. Here are some new (to me) knitting links. Love your blog...I have been following for a while now. I am knitting a hoodie shawl(a shawl with a hood attach) and socks right now. Knitting is one thing I can do with my medicial condition and it is something that I can do a bit at a time when I am able to. It is 35 C here today, but there's always something on the needles. I'm a knitter and find my projects to be very cyclical. 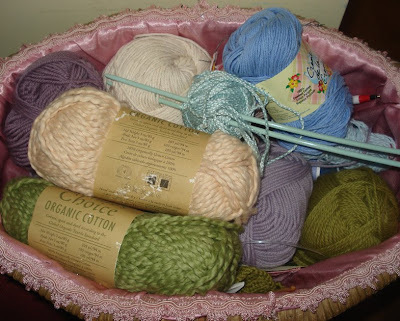 May to August is cotton yarn weather - I usually crochet dish clothes & knit string grocery totes. Both are portable projects perfect for park or pool. September to December is sock time and I usually knit 4 or 5 pairs. I have a couple of things on the go at the moment. A shawl for my Mum, A shawl for me, jumper for hubby, a crochet scarf, I like to have more than one project going at a time. Your jumper is looking great. Today I will mostly be knitting scarves! baby surprise cardigan in wool and alpaca. So soft. It's quite fun to knit, but I keep losing my place because I do it at night after work when I'm tired! I taught myself to knit from books to keep myself busy while expecting my first child. That was 28 years ago! I just recently took it up again. By the way, my comfrey's doing great! Can't wait to use it in my compost and as a tea for my veggies. I really enjoy your blog. I have just started learning to knit. My mother, who is an excellent knitter, is teaching me. I've not long finished my first beanie and have started a second one. I really am enjoying it and do it while I watch TV at night. It's so relaxing. I also lose my place so if I need to do 20 rows, I write the numbers 1 to 20 in a note book and cross them off as I do them! It was actually your blog that encouraged me to learn. You had spoken of having the house clean and tidy and you were going to sit in the sun and knit. I had a vision of such contentment and meditation that I wanted to give it a try. Thank you for that encouragement! It is so true about strangers talking to you about your knitting. I was knitting at a book sale yesterday and I had another adult knitter come to ask about my project as well as a sweet 7yo girl come to tell me about her project she is just learning to knit. 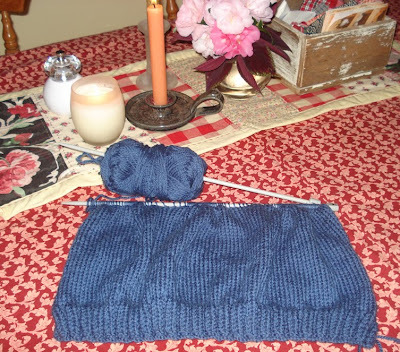 :) I am currently knitting a cotton purse in bachelor button blue for the summer. I love being able to make things for myself and am so thankful for your instructions and encouragement toward living more simply. As soon as school is finished for the year, I plan to make my first batch of laundry soap. Hello ladies! Thanks for telling me about your projects. D in NY, if you grow potatoes or tomatoes, they will love the comfrey as a tea or mulch. That baby cardigan sounds lovely. Diann, thank you so much for that feedback. Sometimes I wonder if what I write does have an effect. When I find others living and doing as we do, it really makes my day. Joy, your knitting sounds lovely. Good luck with the soap! Right now I make simple bath mitts and dish clothes out of cotton yarn. Beautiful and practical at the same time :) :) :) I've also made many socks, Norwegian-style mittens, scarves, hats etc.. I'm knitting my first cardigan for myself, it's a little more challenging than I'm used to, but it's ever such fun, and I'm very much looking forward to being able to wear it. How very satisfying to be dressed ni things you've made! I'd love to have a go at socks - they're next on the list after the cardi! Chasing after my little ones has been keeping me busy and I haven't been leaving much comment-wise anywhere. But can't resist knitting posts. I have 2 wash cloths on the go(my portable knitting for my 15 minute breaks at work), my forever in progress sock blanket, and 2 different shawls. I have varying degrees of difficulty and thread thickness so I have something for any mood/distractability rating. Plus some crochet in between since it is quick and easy. Rhonda, you may be pleased to know that while I've been scaling back my internet time, I've learned to knit! I'm still at the "scarf and dishcloth" stage, but have learned to knit, purl, increase and decrease reliably. My goal is to someday make a lace shawl, but right now I'm so pleased with my little dishcloths! I learned to knit recently. I wish I had more of a community here, but I'm busy enough that its hard to get together with others who also knit. But I'm learning. I have a baby sweater that is tiny-tiny b/c I didn't figure out gauge first. And I started over on a sweater for me when I figured out that the gauge was wrong. I'm still learning all the stuff needed as prep. BTW... all the links on the blog have gone white. I have to tilt the laptop screen *way* back to see them. I don't think I changed anything, but I did notice that the blog went from 3 columns to 2 columns right when the links changed. I love the blog, I'll keep reading even if links are hard to see! Thanks for a post on knitting. I am a bit obsessed at the moment. I started to knit at the end of last year when you had a post about dishcloths - it was a great way to practise my tension and different stitches. I have just finished knitting myself a lovely 12 ply jumper in time for winter. Unfortunately I knitted a size too big which was disappointing but I learnt so much through the process and am really proud of myself for sticking with it over the hundred-or-so hours it took me! I love wearing it around the house on cold days, knowing that I MADE IT! At the moment I am about a third of the way through knitting a gorgeous Jean Greenhowe nativity set. I saw it last Christmas at my grandparents house and knew that I just HAD to make one for my family. It should be finished by Christmas, and I am learning lots about sewing knitted pieces together. I have been knitting lots of little toys for my son and his friends (all around 3years old). It makes me so happy to see that he loves playing with the homemade toys just as much (if not more!) than plastic shop-bought ones. I have knitted a bird, a mouse, little people. I have also been inspired by your blog (and a few otherS) to learn how to use a sewing machine. I have been making simple things so far, like aprons for children, bean bags, mending clothing, I also made a crown and cape for my little boy and he doesn't ever take it off, even to sleep! What joy I get from seeing things I made being loved and used. I love that when I take my knitting to the park while my 3yr old plays that people always come and chat about knitting. So true what you said about knitting connecting people. Have a great day, and thanks for all your inspiring posts and encouragement. PS. You are right about home grown potatoes tasting like nothing else! I just had to grow some after you wrote about that, and BOY! The first one I picked tasted like cream, even though it was just boiled. Delicious. Socks at present. Its mostly socks at the moment because that is what my class are making. I really like the 4 needle thing and wish I'd tried it a lot earlier! Apart from that I'm constructing a pirate costume for a medieval hand puppet show and piecing a quilt or two (the pieces are easy to take with me for those odd moments). I'm finishing up a sweater for myself. A beautiful blue wool (peace fleece's Volgasippi) sweater for myself. But being that it's the beginning of summer and I'm 6 months pregnant, this one is going to have to sit in my drawer for a while! Last weekend I cut some thin slices off of a cherry branch from our yard to make buttons for it. I can't wait until it's all finished. Next up will be the beginning of Christmas presents - little sweaters for the niece & nephew. I'm currently knitting a gorgeous PINK! hooded blanket for our second baby who is due in September. After that... I'll be working on a red jumper that my son has so politely requested. Hi Rhonda, I am only a very basic knitter and it doesn't happen often unfortunately. I am going to try to make time for it soon, but I only want to use organic wool/threads. I was wondering if you knew where I could get some as you live not far from me( I live at Elimbah). I've just finished my first pair of socks, and started on the 2nd pair this evening. Also on the go are two scarves. 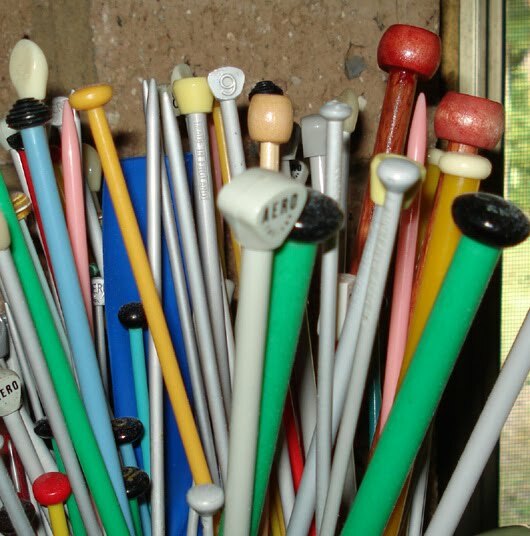 Rhonda - your lovely collection of knitting needles looks very like mine; I inherited needles from both grandmothers so have a collection of metal and plastic straight needles. 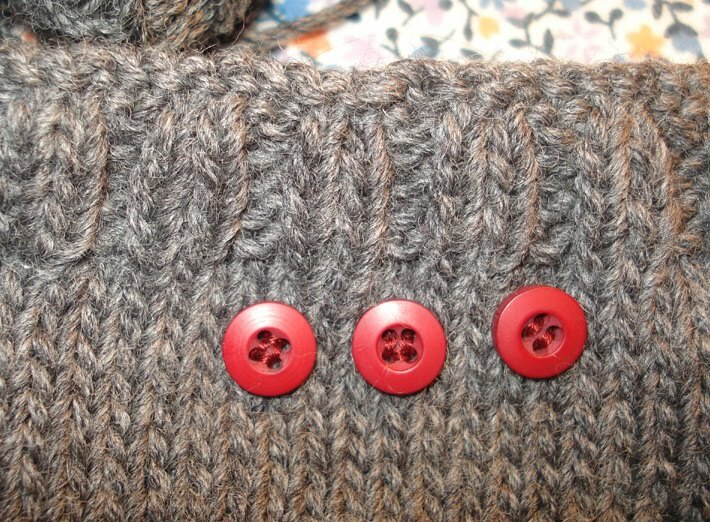 These days I prefer to use circular needles but always revert to the straight ones for casting on. The yarn for Hanno's jersey looks beautiful. Happy Knitting everyone! I knit all year. At the moment I am working on a man jumper, child beanie, a felted bag and a scarf. I am also working on Granny squares as I have just been shown how to crochet. I have been knitting one of your dish cloth patterns and really enjoy it. I don't often have the time to knit as I have three small children. My favorite time to knit is actually when we go to visit my parents. They live a two hour drive away, so I like to knit while hubby drives. It works great for me and I usually manage to get one cloth done on a trip! I have mostly been knitting summer socks in colorful cottons. Also, little handbags with the leftover bits of yarn. I fill them with lip glosses and hand lotions for small gifts. I've just finished a sock (yes, I have to do the other one, but it was quite hard work!!). I'm now knitting and crocheting a mish-mash baby blanket for my 6 month old nephew who I'll be visiting in a few weeks' time. I'm cobbling it together from scraps and offcuts but its coming together well. I hope he'll love it for years to come. You are so right about the "something on the needles" every season! We are heading into summer here in Canada and I have 2 pairs of sports weight socks on the go. I also picked up my drop spindle for the first time in ages and and spinning some mohair. It's crochet in my case. I find it to be very relaxing, even when I'm working on a project and it's problematic. I'm happiest when I have several projects going. I'm allergic to wool, however. I've been making decorative pot holders for my sister's collection, I'm going to see her in a month and take them to her then. I am about to start on clothes hanger covers, which are great to make when I just want to crochet and don't have anything in particular to make. I'm making a stuffed dog for my daughter, and I have the constantly in progress blanket for hubby but it takes spare yarn pieces so it won't be finished any time soon. My daughter also wants another scarf and I think I'm going to make another one for myself and possibly a hat as well. Rhonda, I'm more of a crocheter than a knitter but I suppose that in many senses it's alike. Such as slowing down and always having something on your knitting needles/crochet hook. :o) Right now I'm finishing a baby blanket for our expected new arrival (sometime around the end of August). I think you Australian gals are so lucky to have affordable natural wool! Here in Israel I have to pay an arm and a leg for wool. Thanks so much for the knitting LINKS. I am a recent convert to knitting, with a very long way to go. This is a skills I intend to ensure that my young daughters eventually possess, too. I wish I'd caught the "knitting bug" much earlier. Sigh. wow! you are good in knitting! I'm almost always continiously knitting. In fact, I'm quite addicted. I have a few patterns and info about grops in my area on my blog. Please feel free to vist! And you are right. Knitting connects. Doesn't matter the age or the nationality. It connects.